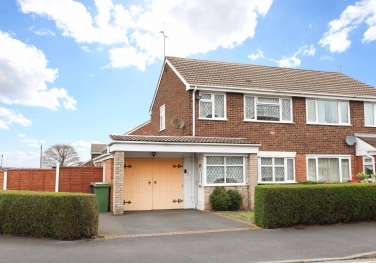 4 Bridge Square is a Three Bedroom Semi-Detached house positioned on a large corner plot located in a popular residential area close to all local amenities. 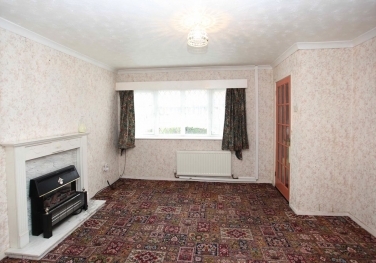 The property requires refurbishment/modernisation and benefits from having No Upward Chain. The property is positioned on a large corner plot with a small parade of shops opposite and a Primary school close by. Telford Town Centre with its covered shopping centre, retail parks, train station, and M54 motorway connection points is about three miles south. 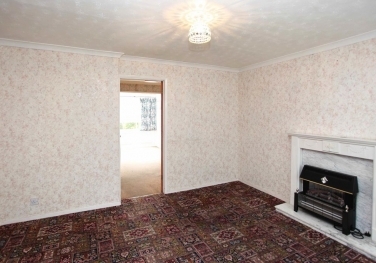 ENTRANCE HALL: Having panelled radiator and Multi- paned door to lounge. LOUNGE: 3.80m x 3.90m (12’6” x 12’10”) Lounge with feature Adams style fireplace surround marble effect hearth and back. UPVC framed double glazed bay window with outlook to the front. 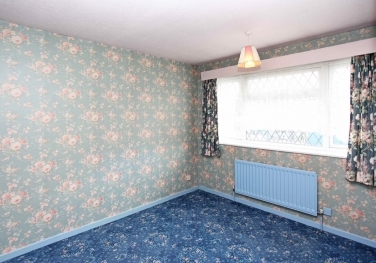 Panelled radiator. Multi-pane door to full width Dining Kitchen. 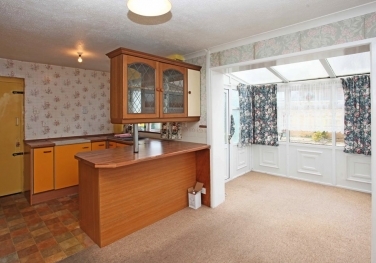 DINING KITCHEN: 2.80m x 4.80m (9’2” x 15’9”) Dining area with panelled radiator. 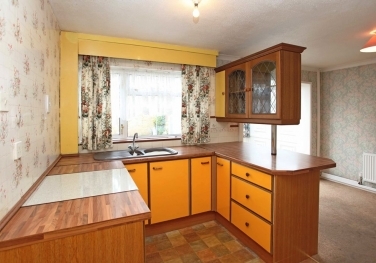 Kitchen having a range of fitted base cupboards and comprising a one and a half bowl sink unit with single and corner cupboards below. Further corner, single and half cupboards all with roll-edge worktops to finish. 3 drawer unit with Breakfast bar above. 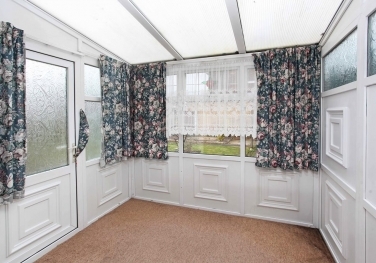 UPVC framed double glazed window with outlook to the rear garden. Understairs shelved cupboard and door to Utility area. From the Entrance Hall stairs ascend to Landing. LANDING: Having UPVC framed double glazed side window. Built in cupboard having lagged hot water cylinder. BEDROOM 1: 3.55m x 2.75m (11’8” x 9’) Having a panelled radiator and UPVC framed double glazed window with outlook to the front. BEDROOM 2: 3.15m x 2.61m (10’4” x 8’7”) Having panelled radiator and UPVC framed double glazed window with outlook to the rear garden. BEDROOM 3: 2.21m x 2.10m (7’3” x 6’11”) Having UPVC framed double glazed window with outlook to the front. MODERN WET/SHOWER ROOM: White suite comprising low level flush W/C and a wash hand basin. Fully tiled walls and an electric Mira shower. Panelled Radiator and UPVC framed patterned double glazed window. OUTSIDE: The property is set back from the road behind a neatly maintained box hedge and a small front garden mainly finished to lawn. Tarmac surfaced driveway providing off road parking for 2 cars. Attached single garage having double side hung doors to the front, power and lighting. Also a central heating boiler. Rear connecting door to Utility. Utility having stainless steel single drainer, single basin sink unit with cupboard below. Also plumbing connection for a washing machine and panelled radiator. UPVC framed/double glazed external door to rear garden. 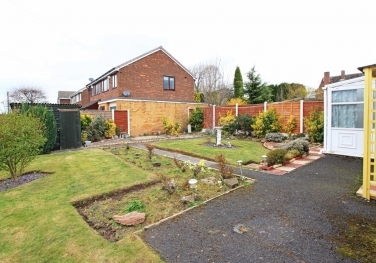 The large rear garden has been landscaped and provides areas of formal lawn, well stocked borders and a small patio. Outside tap. SERVICES: All usual mains services are understood to be connected to the property. 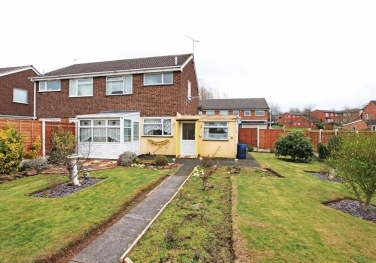 VIEWING: Strictly by prior appointment with the Agents Telford Office – 01952 201700. 1. While we endeavour to make our sales details accurate and reliable, if there is any point which is of particular importance to you, please contact our office and we will try to check the information for you. The information in these property details is believed to be accurate but Tempertons does not give, nor does any Partner or employee have authority to give, any warranty as to the accuracy of any statement, written, verbal or visual. You should not rely on any information contained herein. 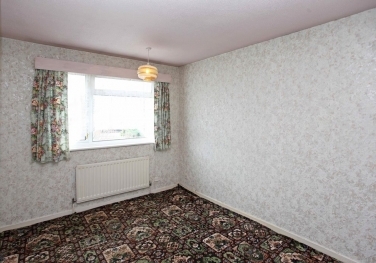 If you wish to ask a specific question about this property, please speak to the sales advisor, who has inspected the property. 3. Our room sizes are quoted in metres on a wall-to-wall basis to the nearest one tenth of a metre. The imperial equivalent (included in brackets and correct to within 3 inches) is only intended as an approximate guide for those not yet conversant with metric measurements. Measurements should not be used for ordering fitments or new carpets etc. HOMEBUYERS SURVEYS AND VALUATIONS undertaken by CHARTERED SURVEYORS with considerable experience in preparing a wide range of surveys and valuations to suit all requirements. Details of fees given without obligation. PROPERTY LETTING - TEMPERTONS have considerable experience in the Letting and Management of all types of residential property. Further details given without obligation.